What is Richmond Hill Blooms? 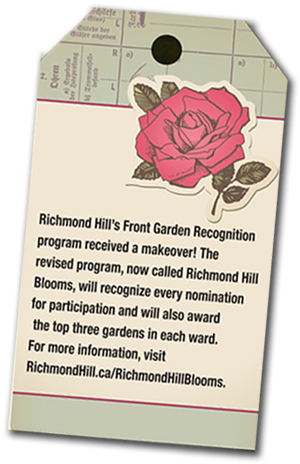 Richmond Hill Blooms, formerly known as Front Garden Recognition, is a program designed to beautify Richmond Hill by encouraging residents to create attractive, colourful and well-maintained front gardens. Gardens are nominated by neighbours, friends, relations or even by yourself. Front gardens within the community are eligible for nomination. Every nominated garden will receive a participation sign provided by the Town. Of these, twenty gardens in each ward will be selected for participation in a competition, which will be judged by members of the Richmond Hill Garden & Horticultural Society. Judges will then determine which gardens earn first, second and third place prizes in each ward; which will be presented by the Town of Richmond Hill. How can my garden be nominated? How will the gardens be judged? Gardens identified as the top twenty in each ward will be judged by members of the Richmond Hill Garden & Horticultural Society, using Ontario Horticultural Association Gardens and Special Planting criteria. Gardens will be judged based on Design, Use of Plant Material, Condition & Maintenance, Hard Landscaping, Environmental Practices, Community Contribution and Distinction. When will the gardens be judged? Shortlist judging will take place between July 8 and July 26. Judging to determine the top three gardens per ward will take will take place between July 29 and August 16. When will the prizes be presented? The residents responsible for the top three gardens in each ward will be honoured at a special celebration on September 19 at the Richmond Hill Centre for the Performing Arts. More information will be posted when available. The 2018 first place gardens in each ward will be ineligible from being awarded a first, second or third place designation in the 2019 program.